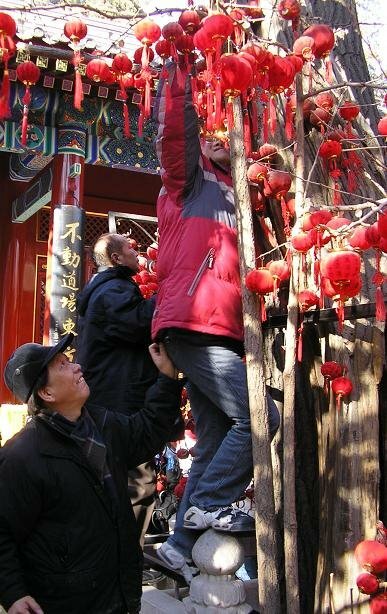 This photo was taken near one of the eight temples in Badachu at the outskirts of Beijing, China. 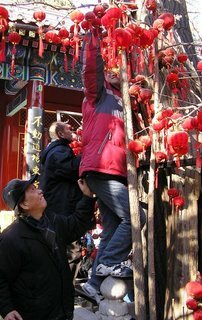 People hang small lanterns in this centuries old Ginkgo on which they write messages of love and good wishes. * Added two photos of bonsai trees. * Added to Spanish Art-picture gallery: Ariel Palacio, Giorgio Armani, Art Nouveau stamp. * Added to Art-picture gallery: Ariel Palacio, Giorgio Armani, Art Nouveau stamp. Beautiful site!! Can somenone tell me if it"s possible (ok it is..) and recommendable to use the leaves of my own tree ( 25 years old). And for what can I use them. Please give me some advise en recipes. Thanks. Beautiful Ginkgo photos can be viewed on the photo gallery by Hubert Steed. * Added photo of Ginkgo biloba 'Lakeview'. * New photo photospecial page: Ginkgo in Reading, UK. * Added Fossils-page in Spanish language. Translation Eduardo Arancibia Diaz, gracias! * New recognitions: Botanical Society of America + Florida Museum of Natural History.